Supply chain management can be a very complex task due to the volatile nature of the many factors you may need to deal with. This probably will never change so you need to learn how to adapt and quickly react to changing environments. Thirty-two percent of organizations claim that processing end customer demand along with coping with unexpected supply issues account for some of the biggest risks in the supply chain! However, the right ERP (Enterprise Resource Planning) solution can greatly relieve some of the burden and lower the risks. To accomplish this, an effective ERP solution must have the characteristics described below to properly streamline your supply chain management. Daily planning: Allows companies to adjust their workflow and meet deadlines and better cater to buyers’ demands. Demand management insights: Allow companies to find trends before they interrupt or affect the bottom line. Companies can better analyze customer demands and position inventory to distribution channels which are closer to the points of utilization and reduce order lead-times. Wouldn’t your organization like to know how to prevent late shipments, rush orders, or unexpected time constraints and be able to do something about it? Real-time data can make all the difference and improve the agility of your company’s supply chain process. Automation is an important tool when it comes to streamlining your business. But you can’t automate without having a good way to manage and track your inventory. Manual tracking has a lot of downfalls. It is subject to human error, it is very time consuming, and ends up costing more money in the long run. Barcode tracking is far superior to manual inventory counts because it’s easy to use, faster, and not prone to errors that can cause inventory to be either over or under counted. When barcode data is tied into an ERP solution, the ERP system is able to provide the products’ locations and statuses with just a few mouse clicks. This helps you make optimal decisions and provide better visibility on where to store products and optimize usage of the limited storage space you may have. 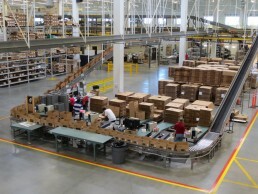 This, in turn, saves money and helps to streamline the supply chain process. While it is always important to hold enough inventory to provide your customers with good lead=times, having too much inventory represents underutilized assets and can increase both waste and your inventory carrying costs. Underutilized assets mean inefficiency and poor return on investment. A better understanding of how your inventory assets are used will allow you to increase ROI and efficiency. Companies tend to have to deal with many different relationships with vendors, customers, suppliers, and carriers to maintain the optimal delivery management. One strategy to handle this is to outsource your delivery process. 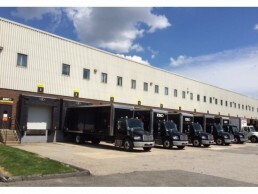 By having another company deliver your merchandise from your distribution warehouses to your customer’s store or location, you may be able to achieve better results. The delivery company’s economies of scale and greater experience will provide more efficiencies and cost savings than doing it yourself. Utilizing the right software will help you streamline your supply chain processes. From asset and inventory management to making informed decisions, the supply chain processes can be greatly improved through a proper ERP solution. It’s important that you are able to make informed decisions about your inventory and your company needs to know the status of its inventory in real-time. Data that can be seamlessly integrated from sales to inventory management can make the entire supply chain process run more efficiently on all levels of the organization. To be able to utilize a fully-integrated, all-in-one ERP solution for supply chain management, you need to go with Kechie ERP – the next generation of cloud ERP solutions. See how Kechie can help you - we'll send over some information and answer all of your questions.